Life is always about finding the balance of action and relaxation. It’s like breathing – inhale and exhale – or Ying and Yang, black and white, light and shadow or the Lady and the Tramp! Make sure you are in balance – it will higher the quality of your life and you will not only immediately feel better but you also will be more productive and relaxed at the same time. So how do you regenerate, recover, revitalize or just simply said chill? The good thing about meditation: It’s for everyone. Everyone can do it. Maybe you are very open for meditation and you just want to learn a little bit more about it and practice it? Or the complete opposite, you might think now: Really, it’s for everyone?? Pff, well, except for me. I just can’t switch off my thoughts and that makes me even more nervous! First of all: I totally get you. Life Junkies are very active in their mind and that’s sometimes hard to quiet down. My mind is kind a busy bee, too. 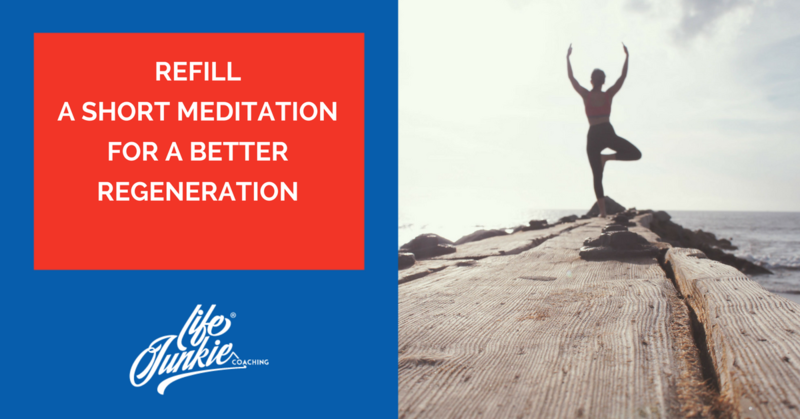 Meditation is a good thing for us Life Junkies! Sitting on the toilet, taking mindfully a couple of deep breaths – that could be meditation already! I totally agree with this funny monk talking about the monkey mind. Meditation is just a conscious way of being mindful and neurologically seen it’s like an energy saving mode for our brain (by the way: toddlers are in this mode very often – that’s why they learn new stuff so easy). In this mode the brain can use its energy to tidy up, relax and reorganize all the crazy thing that are going on up in there in the monkey mind. That’s why creativity is a consequence of a relaxed brain as well. Want to know more about the benefits? I could take hours … but better check this well done video about all the benefits meditation will bring to your life. All you need is just to allow yourself to forget all the ideas and “buts” you have about meditation. Don’t try too hard to relax – if thoughts come and go, just let them come and go. Don’t try to control, don’t try “to do it right” – let it go. It’s not a competition. Take it easy and you will get the best out of it. That’s all you need. Meditation is just being mindful and allowing your brain – and with this your whole body- to recover and refill. That’s it. You don’t need to be a hippie and burn incense sticks to benefit from meditation. Meditation is nothing else than purposeful relaxation. Neurologically seen it’s awesome sauce for your recreation. To meditate is also KING to learn more efficiently new things (share it with your school kids!) and to get better results with your workout as well as it’s making your regeneration faster and lowers stress (that’s why we recommend it to our Workout Unplugged Members as well). If you want to get the best out of it I recommend you starting with a short and guided meditation. Maybe with the one I especially made for us Life Junkies. No excuses: All you need is 10 minutes and a quiet place. Trust me, you will feel so much energized after this meditation. This 10 minutes are wisely invested as it is invested in YOU. The 3 most important letters in YOUr life. You are worth taking care of yourself. So now click and enjoy.